IF YOU SCROLL DOWN AND CAN'T FIND SOME OLDER SHOWS, I HAVE BEEN ARCHIVING THEM AT ARCHIVE.ORG (CLICK ON THE LINK TO GO STRAIGHT TO MY RADIO INTERVIEW PAGE). Just how long will it take for politicians to make sure we have clean and safe drinking water? Currently, the water that is coming out of our taps is filthy. On March 22, 2013, at an upcoming event hosted by the Institute of Science in Society, the Colours of Water, ﻿Professor Cummins will be presenting his paper about the pharmaceuticals drugs that are showing up in our drinking water. Andy Oudman (1290 AM CJBK, London ON) and Pam Killeen interview Dr. Terry Wahls about how changing her diet cured her multiple sclerosis (MS). What we know of breast cancer drugs may be spin and bias - January 14, 2013 ﻿A senior scientist at a Toronto Cancer Centre who examined 164 drug trials for breast cancer treatment over a 16 year period says as many as two-thirds showed a bias in the way they reported adverse or negative effects and in how they tried to make the study look more positive than it was. We hear from Dr. Ian Tannock and from other doctors immersed in the oversight and publication of clinical trials.﻿ According to Dr. An-Wen Chan, scientist at Women's College Research Institute and an assistant professor of medicine at the University of Toronto, ﻿"As physicians, we currently have access to a minority of evidence and existing information. We know that only half of trials are currently published and among published trials only some of the results are reported. So, we are clearly relying on a very biased subset of existing information. And, the ultimate impact is that billions of dollars are wasted and hundreds of thousands of lives have been lost over the past two decades....I would be cautious with relying on medical literature." Why "According to a new study," are the five most terrifying words you'll hear in the media! Will a flu shot keep you healthy? In this three-part series, Andy Oudman (1290 AM CJBK, London ON) and Pam Killeen discuss the Tamiflu scandal, fake science and flu shot fear mongering. Over the next two days, guests will include Dr. Tom Jefferson, British epidemiologist and head vaccine researcher at the Cochrane Collaboration in Italy. And, Alan Cassels, drug policy researcher at the University of Victoria and author of the books Selling Sickness; and Seeking Sickness. (December 4-6, 2012) A brief background into the Tamiflu scandal can be seen here. Andy Oudman (1290 AM CJBK, London ON) interviews Anne Kingston about her recent Maclean's article, A National Embarassment. Heartburn pills that cause heart attacks, antidepressants that lead to suicide: Why does Canada trail the U.S. and EU in protecting its citizens from dangerous meds? Giving young children flu shots appeared to have no impact on flu-related doctor visits or hospitalizations during two recent flu seasons, according to a study published in Archives of Pediatric & Adolescent Medicine (2008). The flu vaccine is no more effective for children than a placebo, according to a large-scale, systematic review of 51 studies, published in the Cochrane Database of Systematic Reviews (2006). Research published in the American Journal of Respiratory and Critical Care Medicine (2008) also confirms that there has been no decrease in deaths from influenza and pneumonia, despite the fact that vaccination coverage among the elderly has increased from 15 percent in 1980 to 65 percent now. Children who get the flu vaccine have three times the risk of hospitalization for the flu than their peers who do not get the vaccine, according to a Mayo Clinic study that was presented on May 20, 2009 at the 105th International Conference of the American Thoracic Society in San Diego. Widespread pollution of drinking water by unregulated discharges of pharmaceuticals is potentially damaging to health and the environment. Much of the world’s drinking water is polluted with pharmaceutical drugs or their breakdown products. WHO along with many water suppliers, maintain that the pharmaceutical pollution is not serious enough for concern even though the detrimental impacts of the exposure of aquatic organisms are well documented. The precautionary principle demands that the threat to human health and the environment should be acknowledged; and appropriate measures taken to remediate polluted water and to limit discharges from industrial sources. Science is based on full and truthful reporting yet the Ontario Ministry of Environment choses to publish reports that cannot be independently corroborated because the exact locations of the drinking water sample collections are withheld. Journal editors should not allow this reprehensible practice to persist. The omission of information may well result in the lifethreatening exposure of sensitive individuals to potent allergens or to chemicals such as those that cause autism. WHO is seriously remiss in their role as guardian of the world’s drinking-water supplies. Andy Oudman (1290 AM CJBK, London ON) interviews Heather Gingerich, medical geologist; PhD student at the University of Guelph; fluoride toxicity expert, Canadians Opposed to Fluoridation. She reveals the results of recent lab tests showing that our tap water contains several toxic ingredients. Andy Oudman (1290 AM CJBK, London ON) and Pam Killeen interview Joel Salatin, sustainable farmer/author/activist. He's also featured in documentaries such as Food Inc.; Farmageddon; and, Fresh. Dr. Karen Kan conducts two interviews with Pam Killeen. In their first interview, Pam speaks about adrenal burnout. LISTEN HERE. Then, she discusses her book, Addiction: The Hidden Epidemic. LISTEN HERE. Andy Oudman (1290 AM CJBK, London ON) and Pam Killeen interview Peter Ballerstedt, PhD about the importance of pasture-based livestock production. IS THE 'CURE' WORSE THAN THE DISEASE? Andy Oudman (1290 AM CJBK, London ON) and Pam Killeen interview Kallie Miller of Safe Water London. To date, nobody has been able to find toxicology studies on hydrofluorosilicic acid (HFSA, otherwise known as fluoride). Below are some interviews regarding the cessation of adding hydrofluorosilicic acid (HFSA, also known as fluoride) to London's city water. Guests include Gerry Cooper, PEng, BEng, MBA, Public Policy Advisor People for Safe Drinking Water (who discusses the legal liability issue), and Dr. Paul Connett, executive director of the Fluoride Action Network and co-author of The Case Against Fluoride. Andy Oudman (1290 AM CJBK, London ON) and Pam Killeen interview heart surgeon, Dwight Lundell, MD about his book, The Great Cholesterol Lie. Is Red Meat Killing You? Listen to Carl Lanore interview Pam Killeen about the recent Harvard study which wrongly demonizes red meat. The interview starts around the one hour mark. Click here to listen. (March 21, 2012) For more information read Zoe Harcombe's article, Red Meat & Mortality & The Usual Bad Science. Andy Oudman (1290 AM CJBK, London ON) and Pam Killeen interview Sally Fallon Morell, co-author of the cookbook, Nourishing Traditions, and president of the Weston A. Price Foundation and founder of A Campaign for Real Milk. Ontario raw milk farmer, Michael Schmidt, calls in for a quick visit. Tom McConnell (610 AM CKTB, St. Catharines, ON) interviews Pam ﻿Killeen about the importance of nutrient-dense foods in the diets of seniors. Pam refers to a previous interview she conducted with Kim Rodriguez about the food in nursing homes. You can read Kim's articles -- part I here and part II here. Andy Oudman (1290 AM CJBK, London ON) and Pam Killeen interview parents who have been threatened by medical officials over their decision to NOT vaccinate their children. Included in the conversation are two lawyers: Mary Holland, co-editor of "Vaccine Epidemic: How Corporate Greed, Biased Science, and Coercive Government Threaten Our Human Rights, Our Health, and Our Children," and board member of the Center for Personal Rights; and, Alan Phillips, author of the "Authoritative Guide to Vaccine Legal Exemptions." The Toxic Truth About Sugar. Added sweeteners pose dangers to health that justify controlling them like alcohol, argue Robert H. Lustig, Laura A. Schmidt and Claire D. Brindis. Published in Nature 482, 27–29 (02 February 2012). "...parents in South Philadelphia, Pennsylvania, recently took this upon themselves by lining up outside convenience stores and blocking children from entering them after school. Why couldn’t a public-health directive do the same?" Click here to watch a video of Highlights and Critique of London's Public Participation Meeting held on Fluoride Jan 25th 2012 at Centennial Hall. A report on the genotoxicity of fluoride by Professor Joe Cummins. Submitted at London's public participation meeting on January 25, 2012. Tom McConnell (610 AM CKTB, St. Catharines, ON) interviews Pam ﻿Killeen﻿﻿﻿ about the butter shortage in Norway. She gives credit to Dr. Andreas Eenfeldt for properly educating Scandinavians about the importance of animal fats in the diet. She also discusses why pizza is not a vegetable. Beware of medicinal fiber and high fiber diets. Contrary to popular belief, too much fiber in the diet will lead to all sorts of intestinal problems. For more information about the problems associated with excessive fiber consumption read the book, Fiber Myth, by Konstantin Monastyrsky﻿ and the article below, Fiber Fallacies, by Don Matesz. To learn about the top 12 myths about fiber, click here. THINK BEFORE YOU PINK. ARE YOU A 'VICTIM' OF PINKWASHING? Andy Oudman (1290 AM CJBK, London ON) and Pam Killeen interview Jill Escher, author of "Farewell Club Perma-Chub: A Sugar Addict's Guide to Easy Weight Loss" and founder of Sugar Addiction Awareness Day. Andy Oudman (1290 AM CJBK London, ON) and Pam Killeen interview raw milk farmer, Michael Schmidt, about the much-anticipated, soon-to-be-released decision surrounding his court case. Read more here. Don't believe the dietary dictocrats when they tell us that salt has "joined the dark side." The problem with today's commerical salt is that the minerals have been removed, leaving us with sodium chloride. It's true that we should avoid processed foods and commercial salt. However, have no fear over using a high quality, unrefined sea salt. Humans have included unrefined sea salt in their diets for thousands of years....and healthfully so. I use about 1 - 1.5 tsp per day. Listen to Part I and Part II of the CBC documentary, Salt, with host of Ideas, Paul Kennedy. Host of the Food Network's, Good Eats, Alton Brown takes an hour long and loving look at the only rock we eat: salt. Learn what it is, where it comes from, how it makes everything taste better, and how to apply it in some unusually delicious ways.﻿ Watch here. Are you struggling with salt phobia? Please read Dr. Mercola's article, FDA Warned on Dangers of Salt Restriction: "Recent studies show a correlation of salt restriction with increased heart failure and with insulin resistance leading to diabetes. Studies show that even modest reductions in salt cause an increased risk of cardiovascular disease. Higher incidence of inflammatory markers and altered lipoproteins are also found by researchers evaluating those on salt-reduced diets. These factors are precursors to metabolic syndrome, which predicts heart problems and diabetes." To read more about how dangerously misinformed vegans are, be sure to read Denise Minger's review of the pro-vegan documentary, Forks Over Knives. Carl Lanore, host of SuperHuman Radio, interviews Pam about school food. Tom McConnell (610 AM CKTB, St. Catharines, ON) interviews Pam about﻿ her book, Addiction: The Hidden Epidemic and the death of Amy Winehouse. Andy Oudman (1290 AM CJBK, London, ON) interviews Pam about the problems with industrially processed meal replacement products. Tom McConnell (610 AM CKTB, St. Catharines, ON) interviews Pam about the dangers of fad diets and how to identify a healthy, sustainable diet. Who is Health Canada Really Protecting? The first segment of the presentation is by Pam Killeen (www.pamkilleen.com). She presents her case against fluoride by explaining the work of Canadian dentist, Dr. Weston A. Price. She emphasizes the point that tooth decay is not caused by a fluoride deficiency; rather, it is caused by a combination of the over-consumption of nutrient-deficient, industrially processed foods and under-consumption of nutrient-dense, high quality animal fats in the diet. Then, Dr. Paul Connett, executive director of the Fluoride Action Network (www.fluoridealert.org), outlines several scientifically valid reasons why fluoride should be removed from our city water. Click here for video presentations by Pam Killeen and Dr. Paul Connett. Click here for Dr. Connett's slides. Andy Oudman (1290 AM CJBK London, ON) and Pam Killeen interview Lynn Peterson, former mayor of the now fluoride-free Thunder Bay, ON; Drs. James Beck and Paul Connett, authors of "The Case Against Fluoride"; Carole Clinch from People for Safe Drinking Water; and Dr. Bryna Warshawsky, associate medical officer of health, London-Middlesex County. Dr. Warshawsky believes that in our fluoridated city, 85% of our children having tooth decay is a sign of success and justifies keeping the toxic waste, fluoride, in our water. Factory-farmed chickens are fed arsenic and traces of this toxic element are being found in the meat. To avoid this problem, be sure to buy chicken from local farmers where chickens are pasture-fed. Review of Pam's book, Addiction: The Hidden Epidemic, in the Winter 2011 newsletter, Nutrition and Mental Health, published by the International Schizophrenia Foundation. Review written by Andrew Cuscianna. 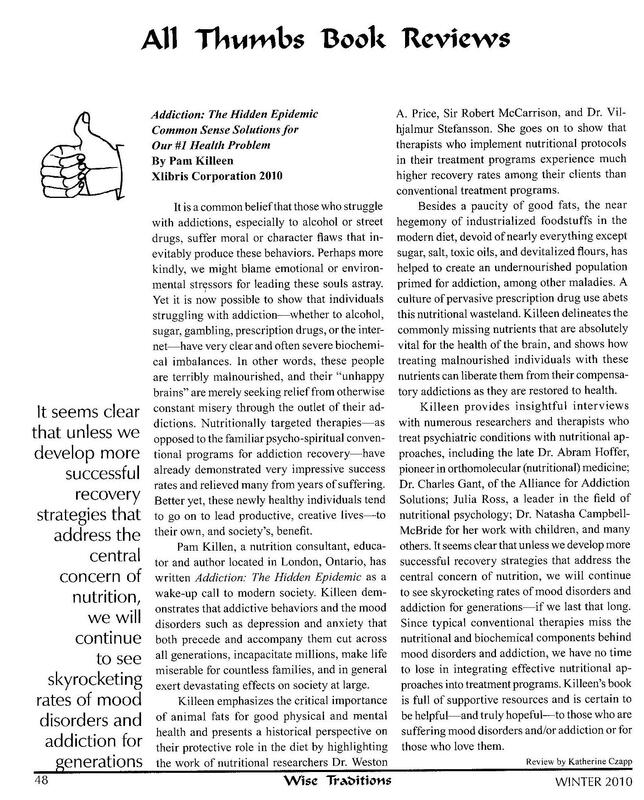 Review of Pam's book, Addiction: The Hidden Epidemic, in the Winter 2011 newsletter, Wise Traditions, published by the Weston A. Price Foundation. Review written by Katherine Czapp. Author Pam Killeen discusses her book Addiction: The Hidden Epidemic on The Livin’ La Vida Low-Carb Show with Jimmy Moore! The end of Rule of Law in Canada: Hugh Reilly and Erin Ademoglu are joined by Daniel Katz to chat with Dr. Eldon Dahl who's home business was invaded by Health Canada aided by the RCMP; constitutional lawyer Shawn Buckley on the danger to personal freedom contained in bill C-36 currently before the senate; Dee Nicholson from the NHF Canada. Then it's author Pam Killeen talking about the true nature of addiction and her latest book on the subject; Dr. Joshua Gelber on how chiropractic can help improve focus and clarity. Prepared by: Raymond Obomsawin Ph.D. Interesting piece about the history of milk published in Food & Drink (Fall 2010). Ontario raw milk farmer, Michael Schmidt, is mentioned in the article. "...recent months have seen health scandal after health scandal, with some of the world’s biggest pharmaceutical companies fined billions of dollars. Alan Cassels, co-author of "Selling Sickness," reports on the questionable outcomes and efficacy of medical screening and the ongoing medicalization of society. Medicine has one of the highest rates of burnout. Experts say some 50% of medical professionals suffer from a form of Post Traumatic Stress Disorder. It's not unexpected - the hours are long, the patients looking to you to solve their problems, and the stakes are very high if you can't. No medical professional wants to compromise patient care, but when they're burned out, it's pretty much inevitable. "Burnout? Try Looking in the Mirror!" Barry Shainbaum (CJTW 94.3, Kitchener, ON) interviews Pam about the unhygienic conditions within factory farms. Garth Riley interviews Pam Killeen, co-author of The Great Bird Flu Hoax and Kaayla Daniel, PhD, author of The Whole Soy Story (www.wholesoystory.com), about the problems and solutions surrounding school food. Production of CHEX TV, Oshawa, Ontario and www.dancarter.ca. "Critic Warns of Water Hazards"
"Supporters tour Schmidt farm on eve of pre-trial hearing"